Welcome to The Long View! 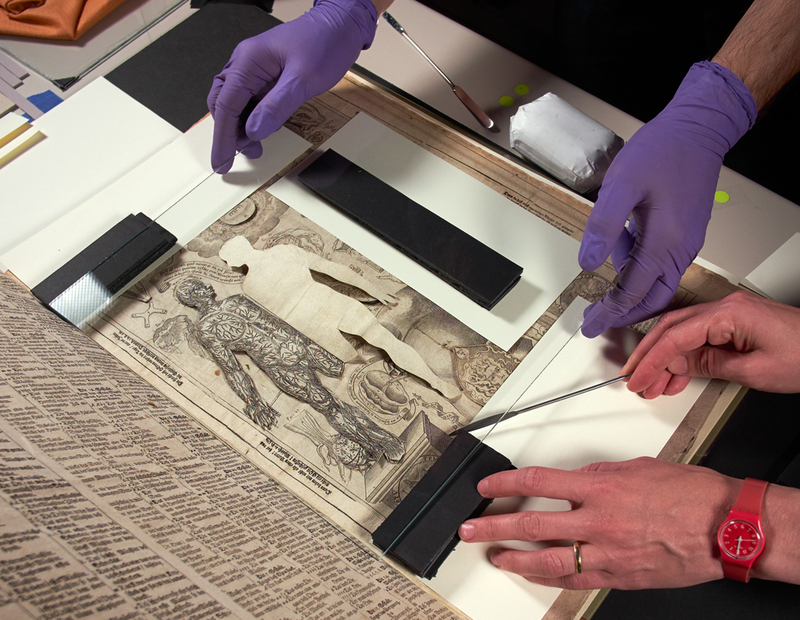 Photographers and conservators work together to image a 17th-century medical book. Photo credit: David Ortiz. Welcome to the Columbia University Libraries’ Preservation and Digital Conversion Division blog. In our work preserving and imaging the Libraries’ diverse collections, we are privileged to work with remarkable materials and amazing people, as well as some awesome tools. As these activities take place in laboratories and spaces that are closed to the public, this blog will be a forum to share our work with the Columbia University community and beyond. We hope you will find our observations and discoveries informative and that you will engage with us through the comments section. We want to hear from you! You may be wondering, what do we mean by “The Long View”? In a division that focuses on both the tangible and the digital, our days are spent engaging with the past, with an eye towards the future. Cutting-edge technology is applied to unique items of cultural heritage; new acquisitions are prepared for circulation; research into historical artistic processes is paired with twenty-first century analytical equipment—all with the goal of increasing access and understanding. How do we make a fragile manuscript, a 17th-century medical pop-up book, or rare Chinese paper gods available to scholars and students? How will we ensure they are still accessible in the future? And what can the original materials and techniques used to make these items tell us about their history, provenance, and significance? These are the questions we ask and the challenges we enjoy. We are not the first to care for these collections, nor will we be the last. So we take the long view, actively engaging the past with the present, and securing its perpetuation into the future. Established in 1974, the Columbia University Libraries Preservation and Digital Conversion Division is one of the oldest comprehensive preservation departments in the country. We are responsible for preserving Columbia University Libraries’ collections in all formats and genres and we achieve our charge by using a variety of tools to prevent or ameliorate damage and deterioration or, if that is not possible, to reformat. We take an active role, in collaboration with our colleagues throughout the Columbia University Libraries, to assure the ongoing stewardship of Columbia’s world class collections. In addition, we collaborate with colleagues outside of the Columbia community to improve and promote preservation nationally and internationally. This entry was posted in Uncategorized on September 26, 2016 by Morgan Adams.